From: Mass Live, May 12, 2014. Wine in a box used to have a bad reputation. Think cheap, sweet wine that you wouldn’t be caught dead serving to friends or a date. But a lot’s changed in the last few years when it comes to wine a box. Nowadays, you can find some truly delicious wines in a box anyone would be proud to serve to guests. There’s great red wines and white wines that come in a box. And since you buy them in larger quantities, they’re almost always more affordable than wine that comes in 750 ml bottles. Box wines also cut down on waste since there’s less packaging involved compared to bottles of wine. Made in Provence, VRAC in French means “bulk goods” and the phrase “en vrac” translates as “in bulk” or “loose.” These phrases refer to how many people buy their wine in France and many other parts of Europe. They go to a store and fill up a container with wine as if they were going to a gas station and filling up a gas can. This no-frills approach extends to the ACME-like packaging for VRAC. The VRAC box doesn’t look like much if you were to see it on a shelf. There’s no dancing animal or whimsical cartoon plastered on the side of the box. In fact, the wine makers seem to have gone in the completely opposite direction and seem to be going for the anti-advertising approach. It’s as if VRAC were packaged in a French Army surplus store. Wiley E. Coyote would be proud. But don’t buy VRAC because or in spite of the name or the packaging. Buy this wine because it tastes great. VRAC might not look like much on the outside, but the wine inside tastes delightful. Frankly, I’m not surprised. Many countries make rose wines, but there’s just something special about most of the roses made in the Provence region. Maybe it’s the soil. Maybe it’s the grapes. Maybe it’s the way these wines are made by the laid-back people who live there and know how to live life right. Whatever the reason, I’ve always been a big fan of roses from Provence, especially since you can often find many affordable ones from there. 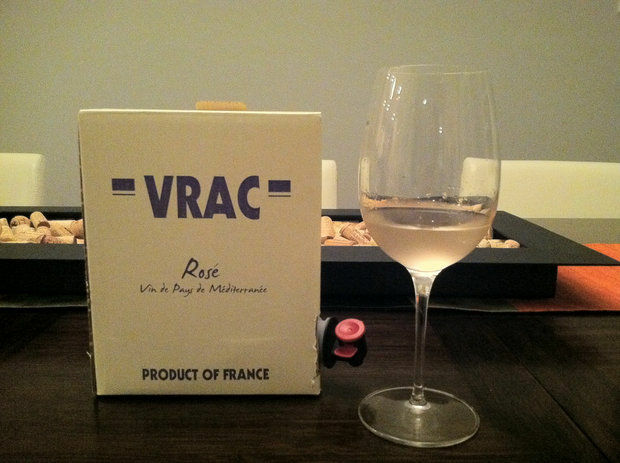 A friend of mine recently had a box of VRAC in her refrigerator and my wife and I could not get over how light and refreshing the wine tasted. A week later, I was out to dinner and had a more expensive Spanish rose and all I kept thinking was I wish I had a had a glass of VRAC instead. What makes the VRAC so drinkable? First, it’s not overpowering. It has a subtle, easy-going taste with just a hint of floral, lavender-like flavors. And maybe because it’s packaged in a vacuum-sealed box, the VRAC we had tasted so delightful, so fresh – like the bottle had just been opened. And then there’s the price. At just over $6 a bottle, you would be hard pressed to find a wine this good that comes anywhere close to that price. Whatever the reason, you can be sure there they’ll be a box of VRAC in our refrigerator this spring and well into this summer. What’s not to like about an affordable, delicious, fresh French rose from Provence?